The hunt for exoplanets is one of the fastest-growing enterprises in astronomy, and for very good reason. An exoplanet, or extra-solar planet, is any planet that orbits a star other than our own Sun. These planets vary in size and distance from their star. If we can find planets with similar composition and features to Earth, we may discover extraterrestrial life, or a potential future home for humanity. This page will explore one of the most bountiful results of the exoplanet search, TRAPPIST-1, anaylsing the composition of this planetary system and the methods used by astronomers to discover it, and how research of this planet will proceed in the future. Astronomers have also been able to determine, based on the temperature of the star and the orbital radius of each planet, that these planets receive a similar amount of light as many planets in our own solar system. 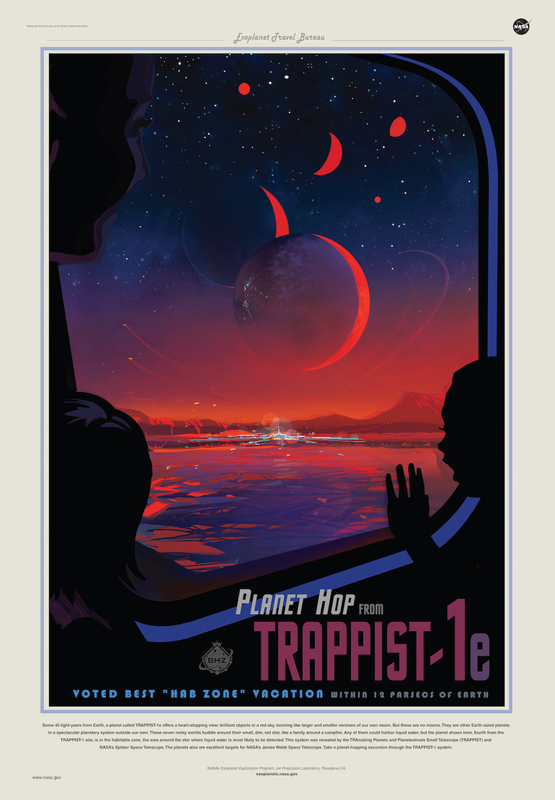 However, this does not necessarily mean they could be in the habitable zone for TRAPPIST-1, as the closest planet, TRAPPIST-1b, has an equilibrium temperature of about 400 Kelvin, which translates to about 127℃, well beyond the boiling point of water.2 At the other end of the spectrum, TRAPPIST-1h (the furthest planet) gets about as much light as Ceres, a dwarf planet in the asteroid belt, does from our sun, giving it a temperature of about -100℃.12 While these extreme cases may not be able to harbour life, it is reasonable to believe that some of the planets between them may have a better environment to host living organisms similar to our own. The potential for life within the TRAPPIST-1 system can also be analysed through observing the atmospheric conditions of each planet. An atmosphere that remains present over very long periods of time is regarded as one of the most crucial criteria necessary for obtaining habitability on a planet. Using mathematical simulations of stellar winds along with the atmospheric ion escape rate for all TRAPPIST-1 planets, a study concluded that planets further away from the star hold atmospheres more suitable for life.16 Therefore, TRAPPIST-1h (the most outward planet) contains the atmosphere that will deteriorate at the slowest pace. 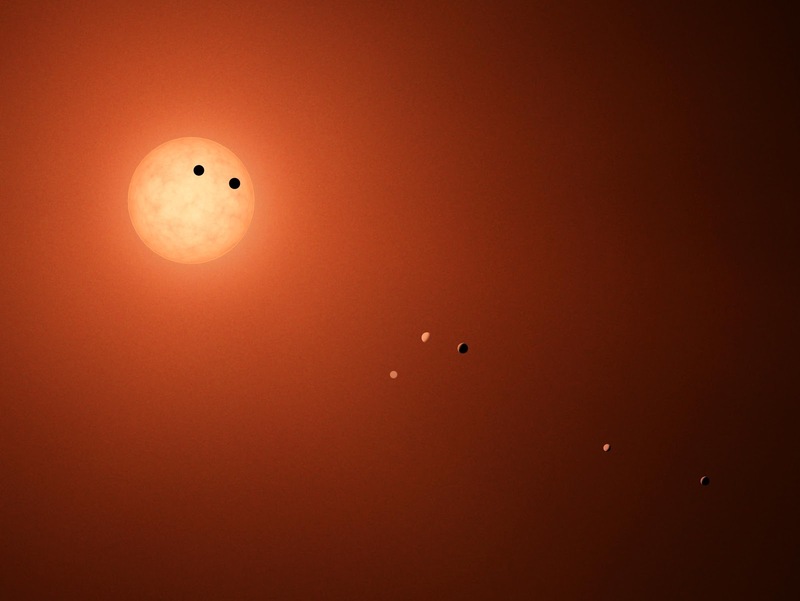 According to predictions based off of the deterioration of Earth’s atmosphere, TRAPPIST-1h will support an atmosphere for approximately 109 years, while the most inward planets TRAPPIST-1b may only support an atmosphere for 108 years.16 This is problematic for the most inward planets because the origin of life on earth took over 5×108 years to evolve.16 It is not certain that all planets will evolve life on the same timetable, however it is our best approximation based on the knowledge attained thus far. The longer an atmosphere is supported, the chances also increase for more complex and even intelligible life forms to evolve.16 TRAPPIST-1h seems like the most capable of fostering life from an atmospheric standpoint, however it does not orbit within the habitat zone, making TRAPPIST-1g (the second furthest orbiting planet) the most likely to harbour life because of its increased chances of holding liquid water. The TRAPPIST-1 system has given astronomers much to consider, but many questions still remain. K2 and JWST are two of the current missions that will work towards uncovering the secrets of TRAPPIST-1. The James Webb Space Telescope, or simply JWST, is a future NASA, ESA and CSA collaboration set to launch in October of 2018.15 JWST is the ultimate multitasker, analysing not only the remnants of the cataclysmic Big Bang, but the formation of solar systems similar to our own, such as TRAPPIST-1. 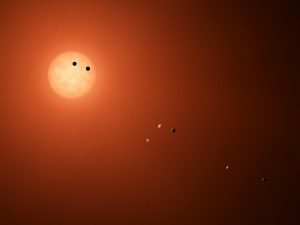 The TRAPPIST-1 exoplanets are all connected in the dynamic and mysterious TRAPPIST-1 system. As you’ve seen above, astronomers have already learned so much about the composition and atmospheres of each planet and their relation to their star, but the search for answers is far from over. Future missions like K2 and JWST look to peel back the veil not only on the remaining unknowns of this planetary system, but on the thousands of other exoplanets that have been discovered just in our own small slice of the galaxy. They will also continue to search for a model that can accurately describe the formation of these diverse systems. Using the transit method and many other useful tools, astronomers are embarking on the largest exploration in the history of mankind, mapping out new worlds in the cosmos and learning new things about the cosmos every day. 16 C. Dong, M. Jin, M. Lingam, V. S. Airapetian, Y. Ma, and B. van der Holst, Atmospheric escape from the TRAPPIST-1 planets and implications for habitability (2017).